Kyle Fox is set to make history as he becomes the first boxer to fight for a title in Worksop on June 30. The 24-year-old headlines JE Promotions’ eighth event at the North Notts Arena, in association with Scott Calow Boxing, titled ‘Hope & Glory’. Trained by Michael White at the Fighting Fit Gym in Dinnington, Fox said of his preparation for his first title contest: “We’ve been putting in a lot more rounds in sparring, I’ve been doing 10-12 rounds and pacing myself and picking my work a lot more. Fox’s opponent, Innocent Anwanyu (25-34-3), is a former Dutch national champion that has experienced over 390 professional rounds in his 62-fight career. Despite not winning a fight since February 2017, he hasn’t been stopped in his last 10 contests against some top prospects and a Southern Area champion. The last person to halt Anwanyu was former English super-lightweight champion Anto Upton in September last year in the final round of their six-round contest. “I’ve seen quite a few clips on YouTube and he seems to be a real tough, inside fighter, short and stocky,” commented Fox. “He’s obviously got knockout power, he’s got something like 15 KOs from 25 wins, but his style and my style will be perfect for me to be victorious. “I’ve told my management team from start that I only want tough fights, I don’t like easy fights because the better the opponent, the better I perform. 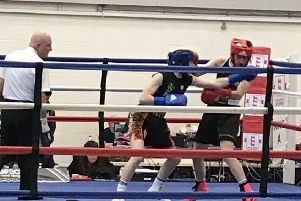 The former Yorkshire amateur champion raced to five fights unbeaten in his debut year in the paid ranks and now looks to step up to become a serious title contender. Worksop will also get to see their newest pro boxer Dylan Clegg as he makes his eagerly-awaited debut in his hometown at super-middleweight against Chessington’s Richard Harrison (2-29). Managed by Scott Calow and trained by Michael White at the Fighting Fit Gym, the former amateur had 25 fights and brings a large fanbase with him to the paid ranks.